A/N: As usual, many, many thanks to Jordan and Sarah for their support that never seems to waver, no matter how many times I ask for assurance that I’m not writing pure dross. You guys are the best! Chris Larabee’s hard gaze moved slowly from the glass of amber liquid in front of him to the stranger at the bar. From where he sat at the corner table, he could see her red-rimmed eyes. She called to the bartender for a refill, and feeling the gunfighter’s eyes on her, turned slightly to her left. Sapphire blue eyes met emerald green ones. Tipping her glass to Larabee, she downed the drink in one fiery gulp. Standing, she picked up the bottle of whiskey and walked over to the lawman’s table. “Mind if I join you?” Without waiting for his answer, she used the toe of one dusty boot to pull out a chair. Sitting down, she filled her glass, then slid the bottle across the table. After a moment, he picked up the bottle and poured two fingers in his glass. As he lifted it to his mouth, she spoke. Tossing back the drink, Chris wiped his mouth with the back of his hand, then sat back and studied the woman in front of him. “Not interested.” Standing, Larabee turned for the door. But a hand on his arm stopped him. Pulling a faded photograph from the pocket of her duster, Sam handed it to Chris. “This is my brother. I was on my way out West from St. Louis to meet him, but when I arrived in Denver, there was no sign of him.” She lowered herself into a chair beside Chris. “I searched the town, high and low, but no one seemed to know anything about him. I know he was in Denver. He had wired me only two days before I left Missouri. Something bad has happened to him, I just know it.” Unshed tears shone in her blue eyes, and her hand trembled as she took the picture back. “Wouldn’t the Pinkertons be a better choice to find your brother?” Larabee questioned. “He looks like a big boy, he should be able to take care of himself.” Chris offered. Larabee moved his gaze from the woman and looked around the small saloon. Chris grinned, the comment reminding him of JD‘s talk of his plans to ride with the Rangers. “There’s a lot of territory between here and Denver.“ Larabee mused out loud. “I’ll wire the others in Four Corners and have them meet us in Rock Springs; we’ll work backwards from there.” As Larabee moved toward the door of the saloon, he called back to the woman. “Get some rest, it’s gonna be a hard ride.” Tipping his hat, he pushed the swinging doors open and was gone, not seeing the two men who joined Sam at the table. After leaving the telegraph office, Chris turned down an alley, taking a shortcut to the livery. The sun was going down, and he wanted to check on his horse before he bedded down himself. He was almost to the door when he was grabbed and manhandled into an empty stall, fighting against his attackers the whole way. Two sets of hands held him, while a bandana was wrapped tightly around his face, preventing him from calling out for help. The blond gunfighter struggled against his attackers, but stopped when the cloth was pulled down so he could see his surroundings. Green eyes narrowed when he saw Sam standing in front of him, a smirk on her pretty face. But the wicked blade in her hand kept him from trying to escape. “Take him out the back way,” she instructed her cohorts. “We don’t want to draw any attention, now do we, boys?” Her lips contorted in a menacing gesture that barely resembled a smile. The two men holding the enraged man half carried, half dragged him out the back door of the livery. Sam led Chris’ horse from its stall and followed them. Once outside, the woman nodded to one of her friends. Darkness claimed the peacekeeper as he was knocked unconscious by a blow to his temple. Tossing him unceremoniously across his horse, they tied his hands and feet together under the belly of the animal. The blistering afternoon sun was high overhead as the small group crossed a river. Chris had the misfortune of entering the water head first, the cold water shocking him awake. He strained to keep his head above water, praying that they would reach the other side soon. As one of Sam’s henchmen led Larabee’s horse ashore, she noticed that the blond had regained consciousness. “Well, Mr. Larabee,” she sneered. “So nice of you to join us.” Stepping closer, she grabbed a handful of hair, jerking his head up. “I thought you were dead.” Releasing her hold on him, she took the knife from the sheath on her belt and cut the ropes holding him on the horse. As painful as the bindings had been, freedom from them was sheer hell. A thousand pinpricks ran along his limbs, making them feel as though they were on fire. Placing her hands on his shoulders, she gave his body a shove. The numbness in his limbs rendered them useless, and he landed awkwardly on the rocky ground. Sam threw her head back and gave a throaty bark of laughter. “My brother? My poor, innocent little brother?” She mocked. “Oh, Mr. Larabee! I need your help! He’s only a child!” Motioning to one of the men behind her, she told him to introduce himself to the gunfighter. Reaching down, the tall man offered his hand to Larabee. “Lars Jansen.” The newcomer smiled down him. “Nice to make your acquaintance.” Anger began to simmer in Chris. Damn fool, he cursed silently. He’d fallen for the woman’s pitiful story about her ‘baby’ brother. Now he was in one hell of a mess. Buck and the others were headed for Rock Springs. He wasn’t sure of his exact location just now, but he was pretty sure it was a good way from Rock Springs. Hell, from anywhere, he thought miserably, looking at his surroundings. “What‘s going on here?” He queried. The single word was punctuated by a fist to Larabee’s jaw that rocked him backwards. Chris’ mouth filled with the metallic taste of blood. Through watery eyes, he saw Sam draw her boot back, but was unable to deflect the kick to his unprotected midsection. His stomach contents rose in his throat, and he struggled to catch the breath that had been ripped from his lungs by the blow. Leaning in close to the green eyed man, Sam raised her knife once again. Running it down his chest, she grinned at the flicker of concern in Larabee’s gaze. Raising the tip of the blade, she slid it under the top button of his shirt. With a flick of her wrist, she sliced the thread. Lowering her arm, she repeated the action on each button until Chris’ shirt hung open, his chest exposed. Sam stared at the lean, muscled chest for a moment, then rose in a sinuous motion. A vicious kick to the ribs caught Larabee by surprise, causing him to cry out. “Who the hell are you?” he ground out between clenched teeth as he struggled into a sitting position. Sam circled around Chris, stopping behind him and laying a hand on his shoulder. Her fingers toyed carelessly with the collar of his shirt. “I can be your best friend.” Larabee reached up and pushed her hand away. The cold steel was pressed to his throat as she jerked his head backwards with a handful of hair. “Or I can be your own personal hell.” Flipping the knife over, she ran the back of the blade across his skin. “Choice is yours, Mr. Larabee.” Moving behind him once more, she pulled the collar of his shirt out slightly, and sliced the knife from top to bottom, rending the garment in half. Jerking the remains of his shirt down his arms, she threw the material to the side, and shoved him down on his back. For the first time since being forced to leave town with Sam and her friends, Chris’ anger got the best of him, and he lunged at the woman. Pinning her to the ground, he was about to demand some answers when a bullet whizzed past his ear, hitting the ground close to his right hand. Lars grabbed his shoulders and pulled him off the woman, throwing him to the ground. A brutal kick to the chest was the reward for his efforts, and he curled into the fetal position to try and protect his body from the barrage of kicks and punches that followed. Chris lay motionless, stunned from the assault. He could only hope that the ringing in his ears would subside soon. Blood ran from the cut that had been opened on the side of his face, and pooled in the dirt under his face. The amount of blood began to concern him as the wound began to throb in time with his heartbeat. He was jerked into a sitting position, and while the two men held him upright, Sam laid the blade of her knife against his throat. When Larabee remained silent, she pressed the tip of the blade against his skin, nicking the flesh enough for a few drops of blood to run out onto the metal. “I asked if you understood me!” she shouted. 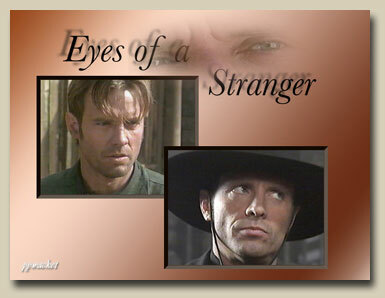 The blond gunfighter raised his eyes to meet hers. “I understand you’ll be rotting in hell before that happens,” he responded in a deadly tone. With a cry of fury, Sam slammed her fist into his face repeatedly. Only when his head slumped lifelessly on his shoulders did she stop. The battered man fell in a heap at her feet. The unconscious gunfighter was jerked roughly to his feet, then lifted between the two men as Sam’s partners carried him to the old mining shack and tied him to a chair. Balling up the bandana, Lars shoved it roughly into Chris’ mouth, then used another one to secure it tightly around his head. “Think she’ll kill ‘im?” The shorter man, Gundersen, asked Lars. Sam’s brother shook his head. “Not before she puts him through hell, she won’t.” He looked at the abused man, almost feeling sorry for him. His sister was a vengeful woman, and this cowboy had no idea what he was in for at her hands. “Kid, you ask too many questions for this early in the day.” Slapping the brim of JD’s bowler playfully, Buck spurred his horse and rode ahead, with the younger man hot on his heels. Sanchez watched the exchange between the two friends with a smile on his face. Vin eased his horse up beside the older man, taking note that Josiah’s weathered visage mirrored his own concern. “Yer thinkin the same thing as JD.” The tracker studied the ex-preacher’s face. Bleary jade eyes fluttered before opening wide. Not that this was their owner’s idea; it was brought about by the incessant pounding on the door to his room. Throwing back his covers, the gambler swung his legs over the side of the bed, not surprised in the least to find he was still fully clothed. This was definitely the last time he would mix cards and that much whiskey. But judging from the roll of bills in his pocket, he’d been quite successful in his endeavors last evening. Not that any of that helped the pain behind his eyes. The pounding at the door resumed. “Ezra, open this door, or I’ll do it for you,” Jackson called. Standing on legs that were less than cooperative, Standish made his way to the door, opening it to find an agitated healer in front of him. “Well, are you going to expound upon this conversation which has you so worked up?” Ezra arched an eyebrow as he waited for the healer to explain. “Do tell, Mr. Jackson.” Ezra replied in a curious tone. The two men descended the stairs to the saloon below. Nathan nudged Ezra and nodded toward the table where Lars and Gundersen were located. A devious twinkle in his eye, Ezra made his way to the bar. Inez served him a beer, then the gambler leaned against the bar, studying the two men sitting at the table. A good soldier always knows his adversaries and never goes into battle unprepared, he thought to himself. Picking up the bottle of whiskey from the bar, Standish nodded to Inez, then walked over to the two men in question. Placing the bottle in the middle of the table, he smiled broadly, the produced a fresh deck of cards from his pocket. A sharp pain in his shoulder jerked Larabee awake. He turned his head to see Sam sinking her teeth into his flesh. The morning sun filtering in through the window made the tiny pearls of blood glisten like a macabre tattoo on Chris’ pale skin. "What the hell are you doing?" He growled. Samantha leaned back and ran her tongue across her bottom lip. "Getting your attention." "Why don't you get the hell away from me," Chris demanded. He didn't see her draw back to strike but felt the sting of her anger on his face. He tried not to flinch, hiding his surprise with mumbled curses, and worked his jaw from side to side. He was actually doing a good job of concealing his discomfort when he felt her fingers gently caress the burning handprint on his cheek. Then her chin came to rest on his shoulder. "You are mine to do with as I please," she crooned. "I will hurt you when I choose, and when it pleases me, I will comfort you." He squirmed at the feel of her warm breath on his neck and stiffened when her lips kissed his ear. He wasn't sure what he did when her tongue, wet and warm, actually slid inside. “Any woman who ever met you, of course.” Sam cursed herself for the slip. It wasn’t time yet. But soon. “Possibly.” Sam stood behind him, so close he could smell the lavender scent she wore. Closing his eyes, he remembered another woman who’d worn that scent. It was getting harder and harder to see her face now. Sarah. Larabee was unaware that he’d spoken the name out loud until the blow from behind knocked him to the floor. A flurry of kicks followed, but still bound to the chair Chris was helpless to do anything except lie there while Sam continued abusing him. Her rage vented for the moment, she gave him one last hard kick, the knelt beside his face. Standing, she turned on her heel and slammed out of the shack, leaving him gasping for air and more confused than before. If he made it out of here alive, this one was definitely going on his list of women he was scared of running into. “Hell, you’ve cleaned me out.” Gundersen picked up his beer and downed the last of it. Lars leaned back in his chair and studied the Southerner. “I think we’ll be heading out now, if it’s all the same to you.” Pushing his chair back, he tapped Gundersen on the shoulder and motioned toward the door with his head. The two men nodded to Standish and left the saloon. Ezra stood and motioned to Nathan. Together they followed the newcomers at a distance. They watched as the men led their horses from the livery. Nathan’s eyes widened when he saw Gundersen lift something from his saddle horn. He nudged Ezra and pointed. “He’s wearing Chris’ hat.” Jackson hissed. Drawing his mouth in a grim line, the confidence man started toward the livery. “Shall we?” He replied. Ezra and Nathan saddled their horses in record time, riding after the two men leaving town. A couple miles from town, they spotted Lars and Gundersen. “Let’s ride around Carter’s Ridge, catch ’em as they come through the cut.” Nathan pointed to a trail off to the left as he spoke. Standish nodded and followed the healer. They arrived at the cut just as the two men rode through. Firing once into the air, Ezra called to them to dismount. Lars seemed to debate a minute, and Standish fired again, this time the bullet severed the reins Lars held and removed any idea of running from his mind. They got off their horses, and Nathan tied the two men up, while Ezra kept the Remington trained on them. After making sure their hands were bound securely in front of their bodies, Jackson removed the black hat from Gundersen’s head none too gently, then walked over to Ezra. Lars remained silent, staring at his boots, but Gundersen began to squirm under the intense green gaze of the gambler pointing a gun at his heart. An elbow to the ribs stopped Gundersen before he could finish his sentence. “Shut up, you idiot.” Lars ground out. Gundersen looked up at the angry Southerner. Beads of sweat formed on his forehead as he stared at the man holding the pistol, which from his position seemed huge. He was unruffled, even in the oppressing heat, the only indication of his anger visible was the fire flashing in the green eyes. “Shut the hell up!” Lars shouted, earning a kick from Ezra for his outburst. “Mr. Jackson, what do you suggest we do with these reprobates?” Ezra ran his tongue across his bottom lip. The realization of their fate hit Gundersen first, and he began to whimper, despite Lars’ repeated attempts to keep him quiet. Handing the revolver to Nathan, Ezra took the rope and began to fashion a noose. This proved to be the undoing of Gundersen, and after emitting a shriek, he started spilling everything he knew. “Where are they?” Nathan demanded. Lars slammed his head into Gundersen’s temple, knocking him over and stunning him into silence. Ezra heard the warning Nathan shouted a second too late as his legs were swept out from under him. Lars landed on the fallen gambler and placed his hands around Ezra’s neck. Standish fought back, but the man on top of him had a good forty pounds and a few inches on the Southerner. Spots began to swim in front of Ezra’s eyes, then Lars suddenly went still, and the body was pushed off him. Nathan reached down with one hand to help him up, while the other pulled the knife out of Lars’ back. “You were about to inform us of Mr. Larabee’s location before we were interrupted.” Ezra replied. “Who?” The man on the ground looked genuinely confused. “The gentleman whose hat you were in possession of when we apprehended you?” Ezra sighed. Nathan tried to hide a grin at Ezra’s frustration. Nathan patted the confidence man on the shoulder. “Let me try.” Ezra nodded, pinching the bridge of his nose between his forefinger and thumb. Taking a silver flask from his jacket, he took a long drink. A noise from behind caused him to turn around in time to see Nathan half-drag Gundersen to a tree and bind the man to the trunk with the rope they’d threatened to hang him with.